Our latest infographic commissioned by the World Economic Forum accompanied a report by the WEF’s Network of Global Agenda Councils on natural resource management in conflict-afflicted countries. 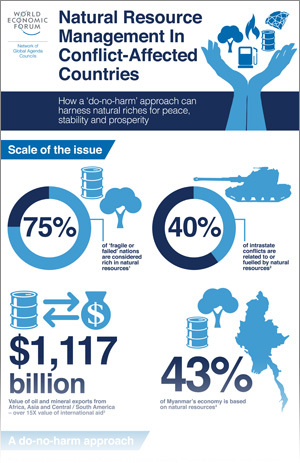 The infographic visually explains how a ‘do-no-harm’ approach can harness natural riches for peace, stability and prosperity. It’s a good example of an infographic successfully highlighting the key issues contained in a full report.